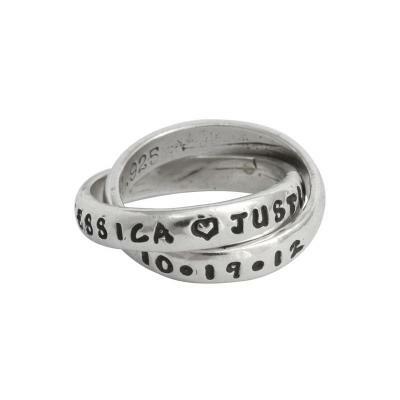 "Promise Ring Silver, Personalized, Hand Stamped Double Band"
Promise Rings are a symbol of your commitment to another person. 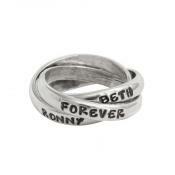 Personalize your couples ring and create a promise ring which is special to you. Sterling silver bands are approximately 3mm wide. Promise Rings are a symbol of one person's commitment to another. Traditionally a promise ring precedes an engagement ring and symbolizes a proposal will occur in the future. 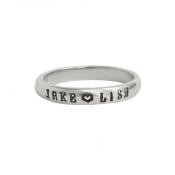 You essentially promise your love and give a Promise Ring as a symbol of your intention to wed. When a person accepts the promise ring it implies the person will wait for the proposal. Personalized Stamps: names, two names separated with a heart, date you met, date you plan to marry, last name, location where you met, bible verse, special words that have meaning to you. The promise ring can be wrapped in our signature lavender and rosebud packaging. So whether it is a gift for you or someone else, the surprise you get when you open the box will make you smile!